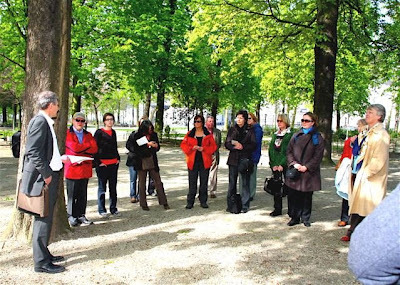 It's been a long cold winter in Brussels but the sun finally came out in time for our guided walk around Brontë places, led by Derek Blyth, during the second spring weekend of events organised by the recently-formed Brussels branch to mark Charlotte Brontë's birthday. This year Robert Barnard joined us from Leeds in the UK to take part in a meeting with writers in Waterstone's and also in the all-day conference on Les Soeurs Brontë à Bruxelles organised by a public library, which to our surprise was inaugurated by the Mayor of Brussels, who switched effortlessly between French, Dutch and English. Eric Ruijssenaars and Maureen Peeck O'Toole, who also spoke at the weekend's events, joined us too, together with other members from the Netherlands, France and the Czech Republic. For some gourmets the high point of the weekend was a Victorian dinner arranged by the conference organisers to round off a long day. 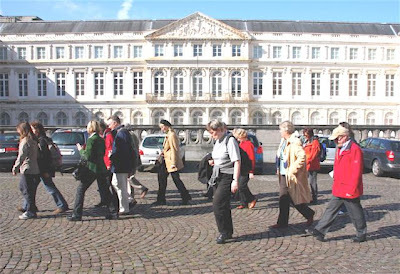 Place du Musée near Chapelle Royale, Protestant church where Charlotte and Emily worshipped. 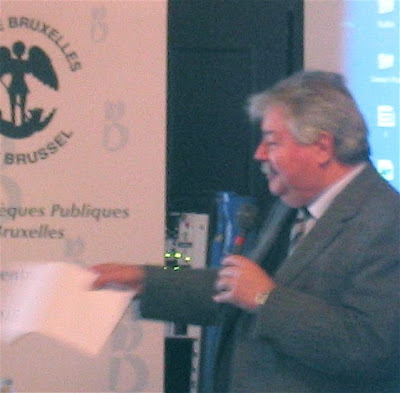 The Mayor of Brussels, Freddy Thielemans, inaugurating the Bronte conference organised by one of the main Brussels public libraries. See link to Brussels group on the right. There will soon be chances to see behind the scenes at the Brontë Parsonage Museum, by taking advantage of a new 'special tour' scheme. The first two will take place on 3 May and 24 May, with more dates to be announced shortly. 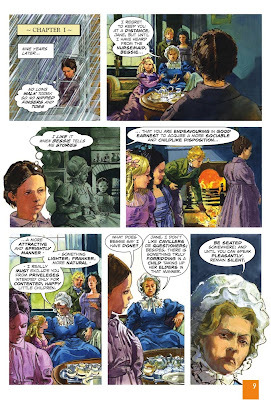 Get a new view of the story of the Brontë Family! Your guide will try to give you a special insight into the lives of the Brontës, and an understanding of why they still inspire people today. Tours are restricted to a maximum of twelve people. 11.15 - visit to the Library and opportunity to view selected items from the collection. 11.45 - end of tour and your opportunity to go back to view the house at your leisure or visit the exhibition in the Old School Room opposite the Museum. All this is being offered for the special introductory price of £12.95 per head. Unfortunately we are not able to offer reductions for children or concessions. There will be a minimum number on each tour of six people. Pre-booking is essential. Call 01535 642323 to do it! 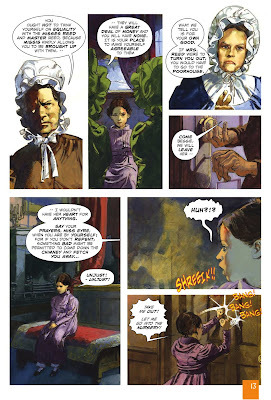 Classical Comics reports that Jane Eyre is progressing well. Sample pages can be seen below. Click on an image to enlarge it. These are described as "still rough in terms of lettering" ........judge for yourself. There is the possibility of a display at the Parsonage at the end of the year or in early 2009. The company welcomes your comments, of course. There has been a rush to get hold of a slice of a tree said to be planted by Charlotte Brontë as part of her wedding celebrations in 1854. The tree unfortunately had to be felled in January as it had become unsafe. The trunk is to be made into a sculpture but a limited amount of the wood from the smaller branches has been sliced up and packaged as a limited edition souvenir. Members have been asked to donate money to the Brontë Society’s conservation fund in return for the package of history and have responded remarkably: in just over a week a thousand pounds has been raised to support the care and conservation of the Society’s collection of Brontë objects. The limited edition packs have been offered initially to members of the Brontë Society in return for a donation of five pounds or more to the charity. Donations have been flooding in from around the world and include one donation of a hundred pounds. The Brontës may have been surprised by the interest but they may have understood it. Charlotte was given a fragment of Napoleon’s coffin by her teacher while studying in Brussels. The small piece of wood is now in the Museum collection. 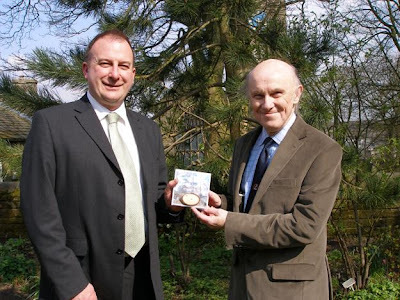 Mr William Callaghan - a Brontë Society member from Oxenhope - was the first to receive his slice of history from Alan Bentley, Director of the Brontë Parsonage Museum. The two men are pictured below. When it was clear that the tree was sick the Brontë Society had sapling grown from seeds from the Cyprus Pine, and one of these has been planted in the Parsonage garden to replace the original tree. This play by Judith Adams (who was Education Officer at the Parsonage a few years ago) is based on the writings and letters of Charlotte Brontë, describing her experiences when she travelled to Brussels, as humble and obscure as the heroines of her later novels. This should be available to listen to on the BBC website (Listen Again) for the next seven days. Ramblings - Clare Balding explores routes with connections to the past. She strides out across the moors behind Haworth in the footsteps of the Brontës with Ann Dinsdale and Judith Bland. They intend to walk to Top Withins, thought to be the inspiration for Wuthering Heights, but they wander a little off course and in doing so forge a much stronger connection to the famous sisters. Available online at the BBC's Listen Again. One of the main Brussels public libraries, Bibliothèque Riches Claires, has organised an excellent exhibition on Charlotte and Emily Brontë's stay in Brussels in 1842-43. This is an initiative of the chief librarian, who had the idea after reading Brontë Society member Eric Ruijssenaars' books on this subject. 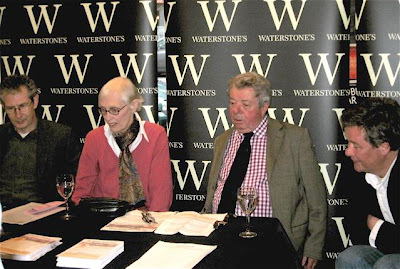 The library, with assistance from the Brussels Brontë Group, is also organising a conference on Saturday 19 April with six speakers including Robert Barnard and a member of the Heger family. 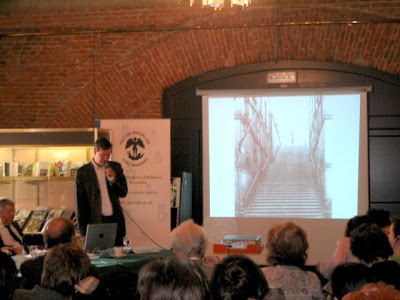 The organisers agreed to time the exhibition and conference to coincide with the Brussels Brontë Group's annual weekend of events. This is an opportunity to see a lot of interesting pictures, photos and books on Brussels in the period of the Brontës' stay and to find out more about the Quartier Isabelle and the Pensionnat Heger. There is also plenty of material on the Brontë and Heger families, and a display of Brontë novels and biographies in French from Brussels libraries with Wuthering Heights translated in at least seven different ways! Why not join the Facebook Brontë group? There are now fifty-four members. The link to the site is here. Of course, you will have to join Facebook. Remy Bumppo Theatre Company presents the American premiere of Brontë, 20 March to 4 May at the Victory Gardens Greenhouse Theatre, 2257 N Lincoln Ave. Chicago , IL 60614 . How is it possible that three Victorian spinsters, living in isolation on the Yorkshire moors, could have written some of the most powerful and passionate fiction of all time? Polly Teale's inventive drama - directed by James Bohnen - examines the lives of three of the most studied and discussed writers of all time. Spurred by their brother's tumultuous personal life, Charlotte , Emily and Anne Brontë write from their remote home on the Yorkshire moors. 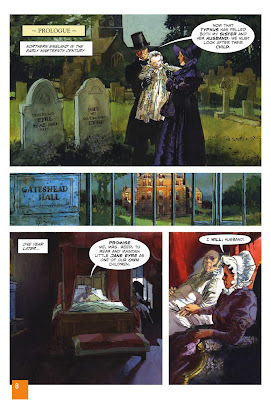 Brontë evokes both the real and fantasy worlds of the Brontës, as the sisters' austere surroundings give way to the boundless power of imagination.